These Aren't Dice - They're Time Machines! Of all of the products I was exposed to in my youth, there are a few that always manage to evoke a deep, nostalgic response. 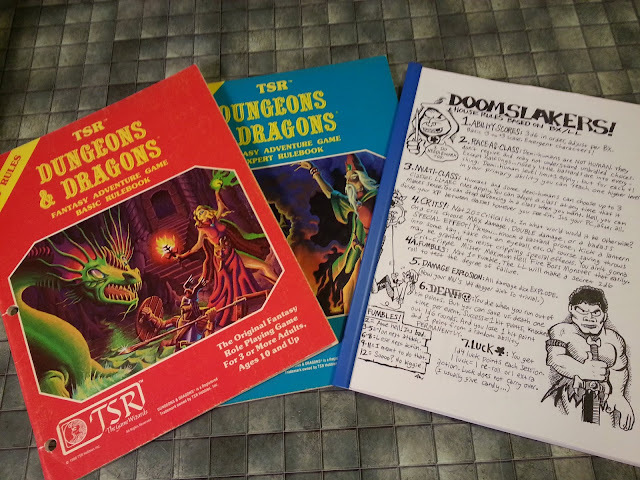 I can't look at the cool, stylized imagery of these old TSR "Dragon Dice" packages without feeling a serious pang of nostalgia. Just seeing these pictures (especially of that awesome blue package!) instantly transports me to 1982, where I'm standing at the counter of B. Dalton Booksellers, latest issue of Dragon magazine in hand, agonizing over which set to buy; I'm at my dining room table of the old farmhouse, rolling stats for a legion of back-up player characters/NPCs; I'm dashing through the streets of Sprechenhaltestelle dodging the bullets of KGB snipers; I'm taking a deep-dive into my imagination, surrounded by the people I care about most, my tribe. 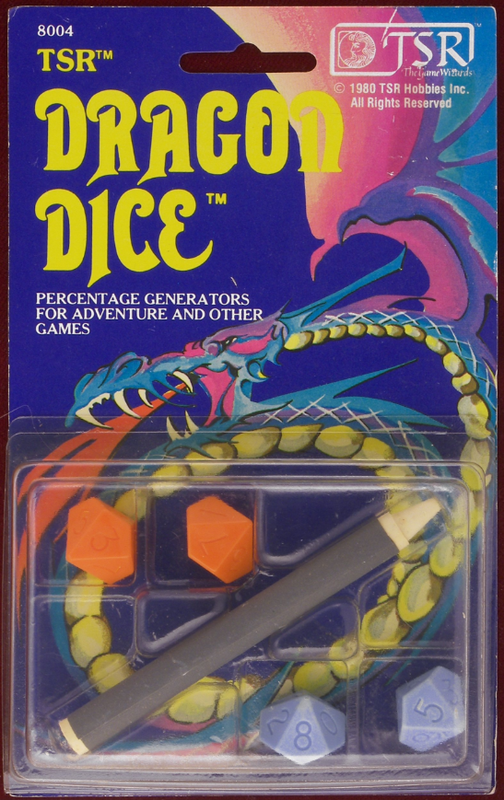 I still have all of my Dragon Dice, including some I added in the past few years (from box sets of Dungeons & Dragons Basic and Expert), as well as those that came with my original Gangbusters, Star Frontiers, and Top Secret boxed sets in the early '80s, and even those from my first Moldvay D&D Basic set from 1981. I don't use them anymore; though, as much as I love them. They really aren't the greatest dice - they're a little too small and way too light. But I occasionally take them out and admire them, and let them mentally transport me back to the period of my life they represent. Does anybody still refer to d100s as "percentage generators"? Did they ever? Gods I loved those dice. You are right, they are not very good, but just seeing them is like having a TARDIS. Suddenly it is 36 years ago and 200 miles away at the B. Dalton's in Springfield IL. I still have mine. But I'd love to have that backing cardstock still. 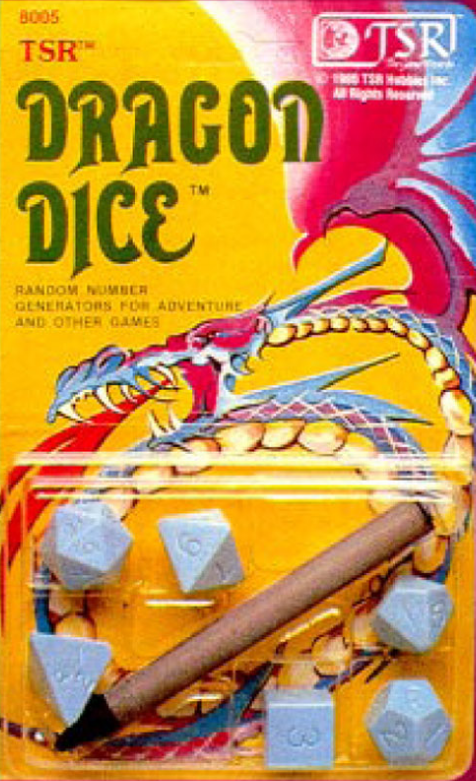 It's weird how I can see all kinds of stuff from back in the day and it does nothing for me, but show me a picture of the Dragon Dice board and I'm a teenager again!